When I moved into residence in my first year of university, the floor’s theme was Willy Wonka and the Chocolate Factory. My mom turned to me and said, “I think you’ve moved into the right place.” And I had. It was the right place for a number of reasons (that are far more important and debatably life changing) but because, at the time, it captured my love of candy and that made me feel comfortable and like I was in the right place. I routinely walk down to Bulk Barn on my lunch to pick up a bag of mixed candies. This is a horrible habit, I fully acknowledge that. There is usually some sort of candy or sweet at my desk at work. Currently there is a small bag of Kraft Caramels, you know the kind that is typically given out at Halloween? Our wedding featured one of the best and most varied candy tables I have ever seen if I do say so myself. It had mini gummy cubs (which differ completely from gummy bears in texture and flavour and therefore are far superior), Whoppers, sour watermelon slices, Polish caramels, Rockets and sour gumballs. The candy table was in addition to our sweets tables, because *shockingly* I also love desserts. I group up in a town that randomly has two candy factories: Rockets and Mars Bars. I’m born in October, the month of Halloween – enough said. So when I discovered that there was a new, high-end candy store open called Squish in the Hudson’s Bay at the Eaton’s Center, I obviously had to go and check it out. Squish is done by the same brilliant people behind David’s Tea. Everything is marketed and packaged in the most beautiful and simple way. They have an insane variety of candy, capturing every flavour and texture you could imagine. The flavours range from sweet to sour, to salty and they also have chocolate. They package their candy thematically and adorable containers, making it even more enticing to purchase. This was one of the most difficult shopping decisions I have ever made. Yes, I am married and bought a wedding dress, but this shopping trip made me more anxious and was much more difficult to decide between all the options. I’m obviously exaggerating but it was a very overwhelming and daunting decision. On my first trip to Squish I bought 5 different types of candy. These candies are what I imagine the candies and chocolates in Willy Wonka to taste like. They are the perfect balance of texture, colour and flavour. My favourite candy was the cherry watermelon gummies. They had such a fresh and summery flavour profile that I had never tasted before. The sugar coating added a bit more sweetness and a little grit to each bite. The red rose gummies had the best gummy texture I have ever eaten. They were chewy and moist, with a slight gush of juice at the center of each. They literally exploded with flavour. The strawberry rhubarb gummies are one of their most popular candies but you can skip them. There is no real rhubarb flavour or sourness and the candies taste completely like strawberries. The chocolates are more like candy. They are silky and luscious and completely taste like the desserts they are emulating. Both were to die for but the pumpkin pie will be my go-to candy this fall. It tastes exactly like a little drop of pumpkin pie without the guilt of a slice a pie. November 8th’s soup: Pumpkin Gruyere soup. All soup is starting to look the same to me… and I am going to stop taking photos of them. I am planning on taking a slight hiatus from soups which is perfect since the weather is supposed to warm up this week (11 degree celcius on Thursday!). Last week I made the pumpkin gruyere soup from my book and I did not like it. To be fair, I added too much pumpkin (Canadian cans are almost twice as big apparently) but then I did adjust the recipe to compensate for this. Pumpkin has such a distinctive taste that I associate with pie that I almost can’t get over it and use it in anything but dessert. The gruyere was supposed to add a smoky, nuttiness to the soup but because of gruyere’s melty quality, the cheese did not fully incorporate into the soup, and instead, made me want to eat fondue. If you like pumpkin, and pumpkin soup specfically, give this soup a try (the recipe is below cut!). I, however, will be sticking with my squash soups for now. 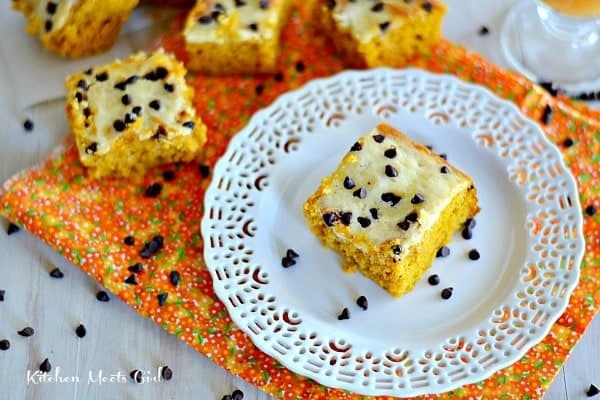 Another way to use pumpkin – make cream cheese swirl pumpkin bars! But don’t actually because I didn’t love these. They were extremely moist, like when you spill milk on your dessert plate. There was too much pumpkin in these bars. The cream cheese swirls added to the extreme moisture of the bars and made it that you had to put the bars in the fridge. I don’t like putting desserts in the fridge – it makes me forget about them and they inevitably end up with a “fridge” taste to them. There was a nice blend of spices that made you feel warm and cosy, a little bite of fall. These spices highlighted the fruity, harvest taste of the pumpkin. Because of the sweetness from the pumpkin I don’t think the chocolate chips were necessary to make these bars complete. There is already a heavy, sweetness from the pumpkin; the chocolate puts that sweetness over the top. Recipe is below the cut. Happy munching! I love to bake. And I bake well. Since we munched hard on these cupcakes at my birthday, you don’t get a photo of what I actually made – just a photo of my Martha Stewart Cupcakes book. These cupcakes were delicious. The cake was light and airy, with the perfect bit of seasonal spice. The pumpkin flavouring wasn’t overwhelming to the point where you feel dejected to have another pumpkin treat on your October birthday. But what really made these cupcakes was the icing. This is one of the best icings ever. It is extremely easy to make and has such a rich, powerful flavor the perfectly tops off your cupcake. The cupcakes dip beautifully into the icing and harden with a seamless coating that can make anyone like a pro. I am going to scour my cookbooks for more recipes that include this icing. There is a pumpkin cookie (also by Martha Stewart) topped with this icing that I am aching to try. Although it is after Halloween, don’t feel like you can’t cook and bake with pumpkin! Recipe is below the cut, and happy munching! Last Thursday I used my new crock pot for the first time to make Pumpkin Chili. 1. Does anyone see chili and think, “Yum, that looks appetizing?” Because I know I don’t. Topped with sour cream, cheese and some bacon, sure, that warrants that kind of response but not normally. I also am not one to love chili but this recipe was so enticing I had to give it a try. 2. I got an ice cream maker last year for my birthday and still have yet to use it. And in August I finally put the bowl in the freezer so I can actually use it. The crock pot however, has already been used. I think this is an improvement and proves that useful is sometime better than fun. 3. When I was a kid, I hated the crock pot. I had a theory that everything that came out of the crock pot was terrible and disgusting. This was obviously not true as my mother is an amazing cook, I was just being a gremlin. 4. I actually didn’t have any of this chili, GC ate all of it (which is perfectly fine and he didn’t eat it all in one sitting so don’t judge him!). GC loved this chili – it was spicy, but not harmfully so. GC is a little bit of a wuss when it comes to spice but he was able to enjoy this, but he was sweating by the end. It had a subtle pumpkin flavour to it; notes of pumpkin rather than a slap to the face with a pie. The beans and ground beef added a heartiness to it, that was warm and comforting. The chili was filling but did not make him feel bloated or uncomfortable. It also kept him full for a long time. A perfect meal to be enjoyed on a cold, rainy day or a hard day at work. Recipe below the cut and happy munching! For lunch on my birthday I went to Toronto’s Food Truck Lot with my sister, Theresa. The Toronto Food Truck lot is located at Yonge and Goulde, near Ryerson University. This is a convenient walk or subway ride away from my work and therefore could be trouble. The lot has room for 5 or 6 trucks that rotate on a daily basis and when we went on Tuesday the following trucks were there: Pretty Sweet Cupcakes, Food Cabbie, Per Se, Caplansky’s, Buster’s Sea Cove and Hula Girl Espresso. I did, however, try Pretty Sweet Cupcakes. I love the design on this truck. It is whimsical and playful. I love the combination of teal and pink, it is retro without being dated. I ordered the Pumpkin Spice cupcake – I wanted to compare it to my own recipe. 1. In a Toronto Life article I read, they claimed that each cupcake had its icing freshly piped on top of the cake and this did not happen. When I read that I thought it was an incredibly ambitious idea because piping bags can be finicky and if icing get slightly warm it can become unmanageable. I do not fault them for not piping to order. If I had a truck, I wouldn’t do it either. 2. Is it just me or does it look like there was something ripped off the top of my cupcake? Or that it was smushed into something? Either way I’m not happy about it. The icing was far too sweet. You didn’t get that rich cream cheese flavour but rather a faint, chalky taste. It was incredibly disappointing. Part of the reason one eats pumpkin, carrot or red velvet cake is for the cream cheese icing. 3. The cake was incredibly moist but it didn’t have a strong enough pumpkin or spice flavour. Part of the problem with seasonal flavours is that is is hard to perfect a recipe when you only get a few months a year and you might only get to make the recipe once. This was a decent cupcake and I would try other flavours from this truck and I would suggest you do too! The food truck lot is amazing and I would suggest you visit. There wasn’t a ton of people there and we only had to wait a few minutes for our food. Our only complaint was that there was no seating options but this is a consistent complaint with food events. Get out while the weather is still nice and support local food trucks! Happy munching! My 24th birthday was on Tuesday and I made myself some pumpkin cupcakes with cream cheese frosting. No, it’s not sad that I made myself cupcakes for my own birthday because I did have offers from my wonderful friends. I love baking so I wanted to make something for myself! I was inspired by the pumpkins that I walk by every morning on my way to the subway. No, I do not live next to a magical pumpkin patch, just a grocery store. Although these gorgeous little pumpkins were my inspiration, I did not buy a pumpkin pie pumpkin to make my cupcakes, i just used canned pumpkin. I find the idea of using a real pumpkin incredibly daunting and a lot of work. But maybe I shouldn’t let my laziness prevent me from using a real pumpkin in my baking and cooking. 1. These cupcakes had a well balanced medley of spices (ginger, cinnamon, ground cloves and nutmeg). It wasn’t overpowering but added the right amount of warmth to make you feel like you were cozy in a pair of sweatpants. 2. They were slightly dry which was surprising due to the amount of pumpkin. This was a complaint that no one shared with me though so maybe I would just being nit picky. 3. This cream cheese icing is amazing. It is incredibly smooth and creamy. It is not chalky or overly sugary. This icing would make everything better. 4. I used various Halloween sprinkles (orange and black, and shapes of ghosts, pumpkins and bats) and wrappers even though I don’t like combining my birthday with Halloween. That is one of the problems with an autumn birthday, it just naturally becomes associated with Halloween and the flavours and colours of Halloween. Recipe (from Martha Stewart) below the cut. Happy munching and happy birthday to me! I am obsessed with fall flavours and colours lately. Everything I am eating and wearing is in warm hues of brown, red and orange. One of my favourite fall flavours is pumpkin and I find that it is extremely under utilized. It seems the only time pumpkin makes an appearance is in a pumpkin pie. Although this pie is delicious and is in fact my favourite type of pie, I want to see more pumpkin being used this fall. I also want to continue using pumpkin after Thanksgiving – people forget that fall technically goes until December 20. I think people are daunted by the thought of using pumpkin because they think they have to use a real pumpkin because the alternative is canned pumpkin pie filling. This is not the case – there is canned pumpkin, which is conventiently puréed and ready to use pumpkin and then there is canned pumpkin pie filling which is offensive and should not be used. On Thursday night I made Spiced Pumpkin Bread. Even if you don’t love pumpkin you will love this loaf. Think pumpkin pies meets banana bread. This bread is moist, spiced and has a slight creaminess from the pumpkin. And of course, it tastes great topped with butter. I would highly recommend this bread for breakfast or for a snack with a cup of tea. Recipe below the cut. Happy festive munching!